The Audi RS7 is one of the sleekest sedans around, it's pretty much the motoring equivalent of with all the right curves in all the right places and looks great with some black leather. It's just as desirable too thanks to that marvel of German engineering, a 4.0-liter twin-turbo TFSI V8 powerplant that churns out 560-hp and 516 lb-ft of torque that can propel the sedan to 62 mph in a mere 3.9 seconds. Unlike Scarlett, there's room for improvement if you feel the need for it. After you let the experienced crew at PP-Performance fiddle with an RS7, there's not much left wanting. For a Stage 2 upgrade, PPP chucked the limiter, added downpipes feeding into an Akropovic exhaust system, a performance filter from BMC and some intense massaging of the ECU's inner workings - all of which results in a power leap to a menacing 745 hp with 744 lb-ft of torque. We can only imagine the growl this setup can produce when that loud pedal is mashed to the floor in furious anger. After sorting things under the hood the tuning house turned its attention to the visuals, again doing things just right. 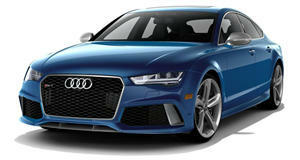 It roped in the services of a company called Cam Shaft who covered the Audi's flanks in the Sparkling Berry vinyl wrap. It's got a near-identical finish to the chameleon paint we're starting to see splashed around on rare luxury cars. The yellow / gold / purple flip is the same as the paint seen in the tuning scene a few years back called Montecarlo Magic. After the wrap, a set of 21-inch Gambit wheels by Schmidt were added once they had received a custom two-tone finish. The final mod before unleashing the RS7 on the world was an adjustable suspension system from KW Suspensions. Do you like? Because we like!